Bioshock Infinite is a visual feast but the gameplay is eh. More specifically, the gameplay is basically Doom with splendid 1910 garb and steampunk weapons and technology. I find myself enjoying exploring and solving such puzzles as there are and not enjoying the tedious gunbattles. The premise for the game is promising, a self-proclaimed prophet builds a modern-day Noah’s Arc, a floating city in the sky like Swift’s Laputa, and secedes from the United States. Now Columbia is a rogue nation state going whither it will after being disowned by the United States following a massacre of Chinese civilians by the flying city in putting down the Boxer Rebellion in 1903. In Bioshock Infinite, the character Colonel Cornelius Slate sends his men to die a “hero’s death” in combat. The city is a creepy homage to everything evil in the idea of American Exceptionalism, from the murderous Motorized Patriot, an animatronic-like machine-gun wielding George Washington robot, to the public stoning of an interracial couple with baseballs. Where the game excels is in the art direction and the overall verisimilitude of the construction of the world. Where it fails, in my opinion, is in the introduction of what are essentially spells, the vigors. It breaks the monotony of the pistol-shotgun-machinegun tedium but so stretches the suspension of disbelief. Even moreso the gate-opening ability of companion Elizabeth, which strains credulity. If she can open a gate to Paris at will, why and how is she locked in a floating tower. But no matter, as interactive fiction, with lots of shooting and gore, the game succeeds brilliantly. And it is worth playing just for the visual awesomeness. 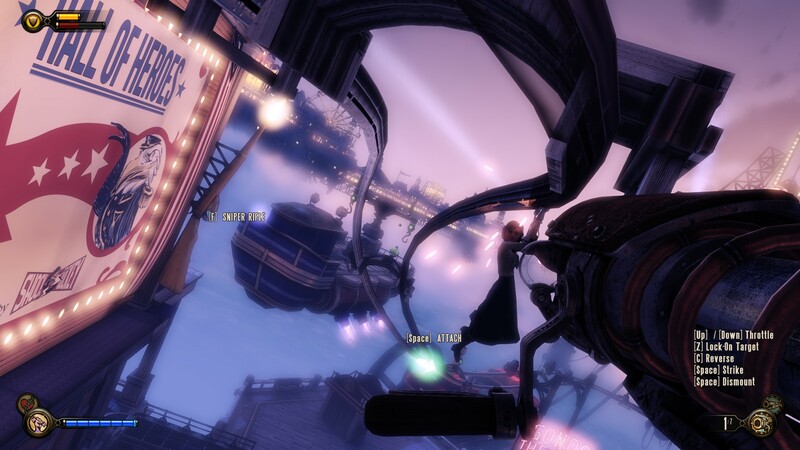 Bioshock Infinite features a series of overhead rails which the characters can hook onto for vertiginous and visually glorious overhead travel between different parts of the Victorian-era floating city of Columbia. Bioshock is a visual treat, a turn of the century romance and a somewhat garbled science fiction epic layered onto a rich tapestry of religion, corruption, slavery and sin. Worth a look, if not sixty dollars.